Insurmountable evidence exists showing the importance of astronomical events in ancient Egypt. The earliest example yet discovered is at the Nabta Playa (circa 6000 BC), where stone megalithic circles were constructed to mark the positions of key stars over a period of possibly thousands of years.2 A granite stone block from the reign of the Second-Dynasty king Khasekhemwy (c. 2650 BC) illustrates the ritual of ped shedj, “stretching the chord,” which was performed before laying the foundation of a temple or monument and relied on the positions of the Great Bear (possibly the constellation Ursa Major, and associated with Set)3 and Sah (the constellation Orion, associated with Osiris) to determine the cardinal points.4 It symbolically tied the monument to the axis of rotation of the vault of heaven. The pyramids at Giza are a testament to the precision with which they were able to achieve this accuracy (within 0.5%, which was proven by Livio C. Stecchini to be aligned using the stars).5 There are still many other examples of the ancient Egyptians intentionally aligning themselves with the patterns and events in the heavens, and these only await further scientific validation. Aside from the planets, it is still debated which exact stars and constellations are listed in these star charts. But the most prominent star in the night sky, Sopdet (or Greek Sothis), known today to be the star Sirius, is one of the few that have been certainly identified. This star was considered the marker for the “Opening of the Year.” It is often represented as a reclining cow with a star between her horns, and was associated with Isis.11 Her consort was Sah, also known as the neigh- boring constellation Orion and associated with Osirus. A very extraordinary feature of the star Sirius is that during the time period spanning ancient Egyptian civilization—and from its exact latitudinal location—the date of the annual heliacal rising of Sirius was barely affected by the phenomenon known as the precession of the equinoxes (the approximately 26,000 year retrograde cycle of the position of the stars relative to Spring Equinox, which is due to the wobble of the earth’s axis of rotation). Due to Sirius’ crossing of the axis between the celestial and ecliptic poles (roughly between 12000 BC and 1000 AD), it was the only star whose annual “rebirth” from the Duat (below the horizon) remained roughly the same number of days apart from the Summer solstice throughout the entire period of Egyptian history—seemingly unaffected by the precessional cycle.12 This was a profound occurrence, that has absolutely no parallel to any known star today. This would have been a prime reason for ancient Egyptians to rely on Sirius to signal the Nile inundation, and presumes that they were also aware of the difference between the Tropical year (365.2422 days, measured by the solstices), the Sidereal year (365.2563 days, measured by the average amount of time it takes for a star to return to its same position in the sky), and the Sothic year (365.2500 days, measured by the annual heliacal rising of Sirius).13 They must have therefore concluded that using the constellations along the zodiacal ecliptic to mark the beginning of the flooding season was unreliable over time, due to the effect of equinoctial precession. Perhaps you’ve been hearing those terms “Sidereal” versus “Tropical” clamored about in online astrology forums a lot recently. Perhaps you’re wondering about the differences between these two zodiacs, and which one is the “right” one? I’ll leave the latter question up to you to decide, but there are a few things about the way ancient Egyptians viewed the stars that you should consider regarding the original use of the zodiac. The most important fact to understand about ancient astrology is that it was essentially observational. This means that primary importance was given to events that could be seen with the naked eye, and (except for those scary solar eclipses) this usually happened during the night. So if your natural sleeping rhythm has determined you to be a “night owl,” perhaps you are just a natural astronomer. There are also several other key differences between the astrological practices of the ancient Egyptians and our modern day practices. In ancient Egyptian astrology, the moon was considered to be a New Moon when the first sliver of light in the lunar crescent could be seen—not to be confused with what we call a New Moon today, that is, a completely dark moon. This was the first day of the lunar month in ancient Egypt, and is the basis of the oldest religious calendars known in history.15 Keep in mind that the achronycal rising sign (the one first appearing at sunset) is always the sign that the Full Moon occurs in each month, and this was the most important regularly celebrated day in ancient Egypt. The twelve-sign zodiac as we know it today (represented by the Ram, the Bull, the Twins, etc.) did not appear in Egypt until after Alexander the Great’s conquest of Egypt in 332 BC and the founding of Alexandria.16 Although hotly debated, most academic scholars agree that the zodiac as we know it originated with the Babylonians in ancient Mesopotamia, sometime around 462-453 BC.17 This original zodiac was sidereal (fixed to the positions of the stars, not the seasons), divided into twelve equal portions of 30 ̊, and was fiducially defined by the star Aldebaran at 15 ̊ Taurus and Antares at 15 ̊ Scorpio.18 Any claim otherwise simply goes against the archeological data that currently exists. The earliest Egyptian writings mentioning the twelve-sign zodiac were written in demotic, using uniquely Babylonian mathematical conventions, and were of Greek origin. P 8279 in the Berlin Museum and the “Stobart tablets” are their corresponding ephemerides (tables of planetary positions computed or observed for regular time intervals). These date from around the first century AD and they indicate that the Egyptians during this period were using a sidereal division of the zodiac into twelve equal zodiacal signs (matching the vernal point at about 4 ̊ Aries for those years. )19 From these artifacts, it appears that the Hellenistic Greeks were introducing Babylonian astrology into Egypt around the same time as the founding of Alexandria. The zodiacal reliefs at Dendera are the most widely known examples of the twelve-sign zodiac in ancient Egypt. There are three of them at the Temple of Hathor, a late Ptolemaic temple built during the lifetime of Cleopatra (c. 30 BC). The two rectangular ones appear on the ceiling in the portico of the Temple, and have recently been beautifully restored to their original colors. The third zodiac at Dendera is the famous circular stone relief that Napoleon’s soldiers brought back to Paris in 1821,21 which currently resides at the Louvre Museum. In its place at Dendera is a reproduction (even painted to match the soot-covered ceiling, accumulated from centuries of people inhabiting the temple). It shows the constellations arranged to form a spiral, with Leo leading—the constellation that arose heliacally on that Egyptian New Year’s Day. 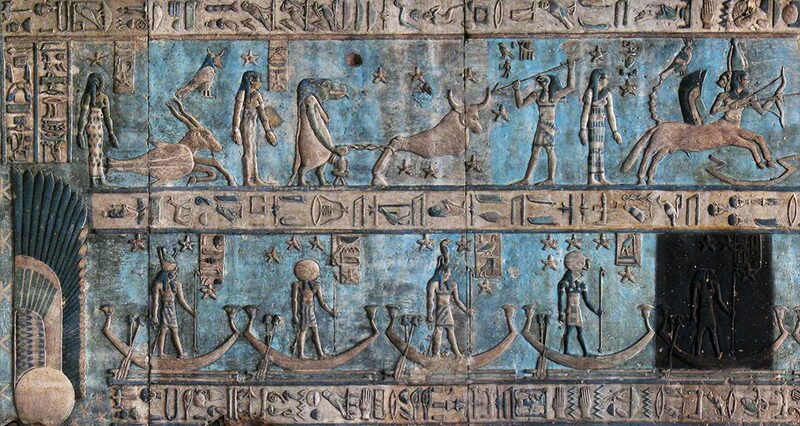 The horoscopes at Dendera all show the planets in their traditional exaltations (the place of a planet’s greatest influence). Thus we have Sun in Aries, Moon in Taurus, Mercury in Virgo, Mars in Capricorn, Venus in Pisces, Jupiter in Cancer, and Saturn in Libra. These exaltations originated as the Babylonian concept of qaqqar nisirti (places of secret revelation), and were estimated to have been in use in Babylonia around 670 BC,22 where they were further assigned to specific stars within each constellation. As you can see, there was a distinct demarcation in Egypt between the periods previous to and following the introduction of the Babylonian twelve-sign zodiac by the Hellenistic Greeks. Both periods, however, employed a sidereal system (defined relative to the stars) and represented the planets and stars as neteru, or personifications of the universal principals of nature. The arrival, disappearance, and interaction between the neteru and their celestial counterparts were all observed by the priest-astronomers as oracles concerning the destiny of their kingdom. The priest-astronomers’ instinct to discover what lies beyond our understanding seems to be a universal trait shared by all cultures, both ancient and modern. We seek an explanation of our place—of where we fit into the grand scheme of things—examining both the infinitely small and the infinitely great. We may never be able to know or accurately articulate that answer. But the ancient Egyptians were at least onto something, for we cannot look into the heavens, seeing the perfectly harmonious movements of the celestial bodies, without gaining at least some insight into the true nature of our own being. 2 J. McK Malville, R. Schild, F. Wendorf, R. Brenmer, “Astronomy of the Nabta Playa,” African Skies 11 (July 2007): 2. 3 Herman te Velde, Seth, God of Confusion, trans. G. E. van Baaren-Pape (Leiden: Brill Archive, 1977), 86. 4 Michael Rice, Egypt’s Making (London: Psychology Press, 2003), 151. 5 Peter Tompkins, Livio Catullo Stecchini, Secrets of the Pyramids (New York: Harper & Row, 1971), 416. 6 Cyril Fagan, Astrological Origins (St. Paul: Llewellyn, 1971), 47. 7 A. Pogo, “Calendars on Coffin Lids from Asyut,” Isis 17.1 (Chicago: University of Chicago Press: 1932): 6. 8 Ove von Spaeth, “Dating the Oldest Egyptian Star Map,” Centaurus International Magazine of the History of Mathematics, Science, and Technology 42:3 (July/August 2000): 159. 9 Cyril Fagan, Astrological Origins (St. Paul: Llewellyn, 1971), 65. 11 H. E. Winlock, “Origin of the Ancient Egyptian Calendar,” Proceedings of the American Philosophical Society 83 (September 1940): 447. 12 Jed Buchwald, “Egyptian Stars Under Paris Skies,” Engineering & Science 4 (Pasadena: Caltech, 2003): 30. 13 Dr A.S. von Bomhard, The Egyptian Calendar: A Work for Eternity (London: Periplus, 1999): 28. 14 Cyril Fagan, Astrological Origins (St. Paul: Llewellyn, 1971), 38. 16 Otto Neugebauer, A History of Ancient Mathematical Astronomy, II (Berlin: Springer, 1975), 565. 17 Robert Powell, History of the Zodiac (San Rafael: Sophia Academic Press, 2007), 100. 18 Ibid, 101. See also: Fagan, 23. 19 Bartel L. van der Waerden, Science Awakening, II (New York: Oxford University Press, 1974) 308-325. 20 Otto Neugebauer and Richard A. Parker, Egyptian Astronomical Texts, III (Providence: Brown University Press, 1969), 62-64. 21 Jed Buchwald, “Egyptian Stars Under Paris Skies,” Engineering & Science 4 (Pasadena: Caltech, 2003): 28. 22 Robert Powell, History of the Zodiac (San Rafael: Sophia Academic Press, 2007), 84.